Slim Harpo Sting It Then - Live! Slim Harpo: Sting It Then - Live! (1961 'Excello') (69:45/20) Enthält die einzigen bekannten Liveaufnahmen dieses großartigen Musikers. Historische Mono-Amateuraufnahmen, die ursprünglich nicht zur Veröffentlichung bestimmt waren. Man hat viel Sorgfalt aufgewandt, um störende Nebengeräusche zu reduzieren. Es bleiben jedoch simple Mitschnitte, zugleich jedoch einzigartige Dokumente um zu belegen, wie Anfang der 60er Jahre einer der populärsten Musiker 'live' arbeitete. Essentiell / historic, monaural amateur recordings that have been restored. Still the sound quality is pretty poor. On the other hand this is an important document, one of the rare examples of early '60s blues performed 'live' by one of the greatest bands of that of tha era. Essential. 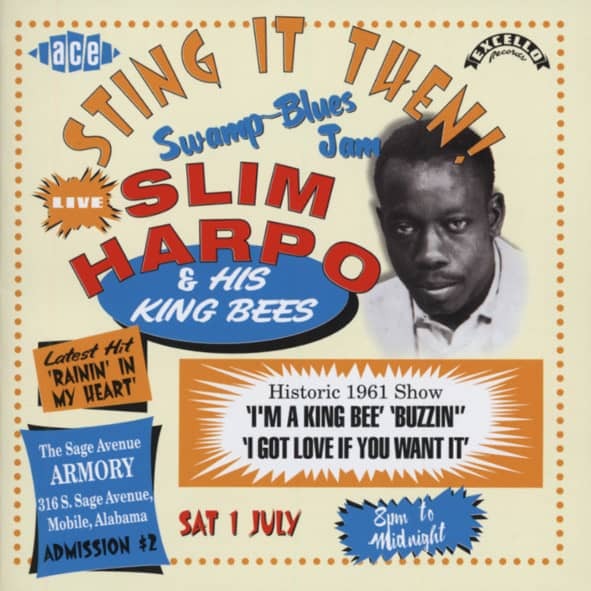 Article properties: Slim Harpo: Sting It Then - Live! Album titlle: Sting It Then - Live! Whether it was another of Crowley, Louisiana swamp blues producer J.D. Miller’s brainstorms or the inspiration of the harpist’s wife (reports vary), James Moore was rechristened Slim Harpo at his first session as a leader in March of ’57 after being informed that his previous stage name, Harmonica Slim, was already spoken for. Miller didn’t have to search very hard to discover Moore, born January 11, 1924 in Lobdell, Louisiana near Baton Rouge. He was a sideman for the producer’s first important blues discovery, guitarist Lightnin’ Slim, and had recorded with him in Crowley as far back as the autumn of 1955. "He was Lightnin's harmonica blower," said the late Miller. "I had no idea that he wanted to make records. He had Lightnin' come and ask me if I'd record him. Well, I hadn't heard him sing, so I told Lightnin', ‘I'll listen after we get through the session.’ I did, and it sounded pretty bad. So I told Lightnin', 'I don't believe I can use him. He's not too good a singer.' He said, 'Mr. Miller, I sure wish you would, because he might quit me if you don't.’ So I said, 'Well, we'll give him another try.'" Miller had a novel idea that would serve the harpist well. "I instructed him to sing nasal," he said. "I'd never thought of that before. I asked him to sing nasal, and he didn't know what that meant. So I got in the studio, 'Sing through your nose, partially.' And that was really unique." Slim was backed that day by guitarist Guitar Gable, Gabriel ‘Fats’ Perrodin (Gable’s brother) on bass guitar, and drummer Clarence ‘Jockey’ Etienne. He came up with a classic his very first time out: The strutting I’m A King Bee incorporated the nasal gimmick perfectly, while Slim’s amplified harp work stuck close to the distinctive melody and Gable’s stinging guitar answered in all the right places. Although it didn’t pierce the R&B charts after Miller shipped it up to Ernie Young’s Nashville-based Excello Records for release, I’m A King Bee found its way over to England in time for the Rolling Stones to include it on their debut album. Slim’s catchy flip side I’ve Got Love If You Want It attracted immediate cover action when Warren Smith turned in a vicious rockabilly rendition on Sun. There was still room at the top of the R&B hit parade for a savory slice of lowdown blues when the groove was as funky as the one powering Baton Rouge harpist Slim Harpo's bayou-bred Baby Scratch My Back. J.D. Miller, the Crowley, Louisiana producer who did as much as anyone to record the region's swamp bluesmen, had unearthed Slim—born James Moore—through his top act, guitarist Lightnin' Slim. The gimmick clicked on the harpist's 1957 debut single I'm A King Bee, which Miller sold to Ernie Young's Nashville-based Excello Records. 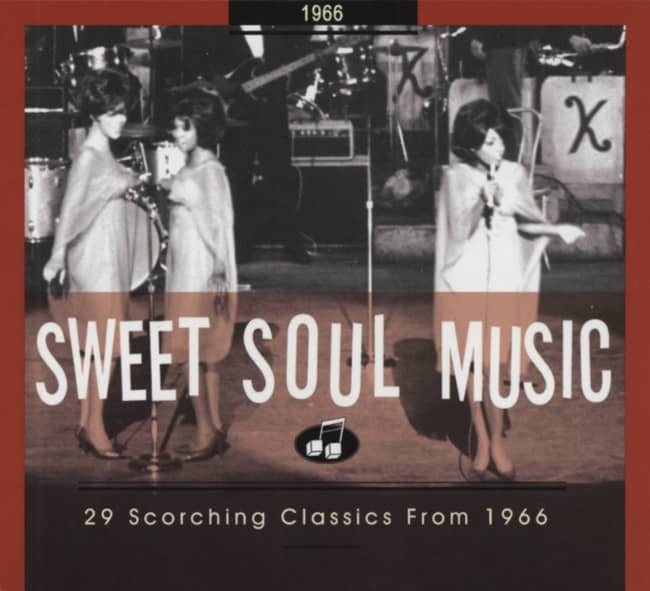 Both Miller and Moore's wife have been credited with dreaming up his stage name, which appeared on a series of splendidly laconic Excello singles, including the swamp pop charmer Rainin' In My Heart, enough of a 1961 pop crossover item to actually get Harpo a lip-synch shot on 'American Bandstand'! Slim Harpo stayed with Excello until he died on January 31, 1970 at age 46, although he broke with Miller shortly after Scratch My Back vaulted to number one R&B and #16 pop. Along the way, his supremely atmospheric swamp blues caught the ear of everyone from Sun rockabilly Warren Smith, who covered his first B-side, I've Got Love If You Want It, to the Rolling Stones, who revived King Bee on their debut LP. Customer evaluation for "Sting It Then - Live!"